You are here: Home / Blog / What is Progressive Outdoor Education? What is Progressive Outdoor Education? Progressive Outdoor Education is an initiative to invest in innovative ways to provide outdoor education to the current – and growing – community of outdoor enthusiasts in the Puget Sound region. Learn how you can apply this process to an activity you care about. The Mountaineers 'Vision 2022' Strategic Plan calls for us to invest in being “innovative leaders in outdoor education.” This means we need to respond to growing needs and address new century challenges in ways that are different from traditional outdoor education. This includes investment in our volunteers – the greatest source of innovation and a priceless resource that is uniquely Mountaineers. We call this new approach "Progressive Outdoor Education." 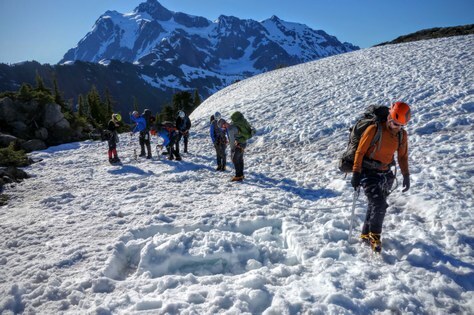 Progressive Outdoor Education is an initiative to invest in innovative ways to provide outdoor education to the current – and growing – community of outdoor enthusiasts in the Puget Sound region. At its core, Progressive Outdoor Education is a process through which we can evaluate and improve our programs to meet the needs of our ever changing community. We believe that part of the innovative solution will be increasing the number of urban learning spaces and investing in online learning to respond to the growing number of people who live in small spaces and don’t own vehicles. But that's only the start. Progressive Outdoor Education is an organization-wide process through which our volunteer leaders and staff can evaluate and implement change to positively impact the course of our programs. What does progressive outdoor education look like? Identify the "problem" and draft a Preliminary Problem Statement – We are turning too many people away – we are not meeting the need. Revise Hypothesis – "Inconsistency between branches is a root cause of volunteer burnout"
Create Details & Timeline Proposal – How will we achieve our goals? Create Business Case Proposal – How will the return justify the investment? Put the right people in place - For PCE, we assembled 4 committees to work on 4 related but separate components of our programs: Curriculum, Techniques, Leadership Development and Access. We also hired a staff person to support these efforts and another staff person to support eLearning. Execute on the timeline - We created a 5-year timeline, and are focusing on implementing Year 1 execution. how can i apply the progressive outdoor education process to my activity? As Mountaineers, we want to develop safe outdoor recreationists, good stewards, and a welcoming community. In every outdoor discipline, there will always be ways we can improve. If you have identified small, incremental changes you can make within your branch or committee, we encourage you to work with your committee chair or seek staff support as needed. If you see a problem to fix or an opportunity for dramatic improvement in a particular activity that can be applied across the organization, especially if the solution isn't immediately apparent, Progressive Outdoor Education might be a good process to engage in. Progressive Outdoor Education is an organization-wide process, which will require volunteer time as well as organizational resources. Before engaging in a Progressive Outdoor Education process, activity representatives from all applicable branches must submit a proposal to the Branch Leadership Committee. It's important to work collaboratively on this proposal, and as a group, you can align to define a common problem or opportunity, and to test a common hypothesis. If you have ideas for a way to improve our programs organization-wide, we encourage you to start by attending your next Activity Summit. If your Activity Summit is a long ways off, contact one of our Adult Education Managers to get in touch with the appropriate Activity Summit group. Define the problem or opportunity. How are we failing to reach our potential in this particular activity? Test and refine the hypothesis with constituents from every branch and committee that engages with this activity (in many but not all cases this will be the summit group). General scope of the process – how complex is the problem, how much time and energy should we invest, and what will the return be? What types of projects is the Progressive Outdoor Education process best suited for? The process is designed for problems or opportunities where the solution is uncertain or the pathway to success is unknown, AND there is a need for hypothesis testing before investing in a solution. It's a strategic process that can be both fascinating and fun, but it also requires a significant investment of time from volunteers and sometimes staff. What are some other examples of projects? Problem - First aid is taught differently and the certification requirements vary from committee to committee and branch to branch. This inconsistency puts us at risk. Vision - If every committee had the same requirements of their leaders and taught first aid the same way, we would empower our leaders to lead more trips and reduce our risk. Hypothesis - Inconsistency results from: some committees not wanting to ask leaders to pay for recertification; a 16 hour course is too much time commitment to ask from a volunteer every 2 years; there has been a lack of collaboration. Proposed scope - Inventory existing practices, assemble a committee, survey leaders, propose a solution. Problem - We have a serious lack of leaders and as a result we can't offer enough spots in our courses to meet the current need. Vision - With a clear pathway to BC Ski Leadership and a vibrant community of Mountaineers BC Skiers, we can meet the growing need in our community. This will improve the collective talent in the BC Ski community, and will increase revenue for the organization through the ability to serve more students and members. Contact Sara Ramsay or Steve Smith, our Adult Education Managers.